Air Canada chose Valentine’s Day to announce a number of route changes that consist of removing older, slower, more frequent and smaller regional propeller planes (the Q400s) currently operating under Jazz and substituting newer, faster (by about 20 minutes in Thunder Bay's case) less frequent but larger jet aircraft (A319s) operating under the Rouge banner. In the case of Thunder Bay, this means that the current six flights a day to Toronto (with 78 seat capacity for each flight) will be replaced with three flights a day (with 136 seat capacity each). If you do the math, daily capacity on the Thunder Bay-Toronto run for Air Canada will actually fall from 468 to 408 – a drop of about 13 percent. 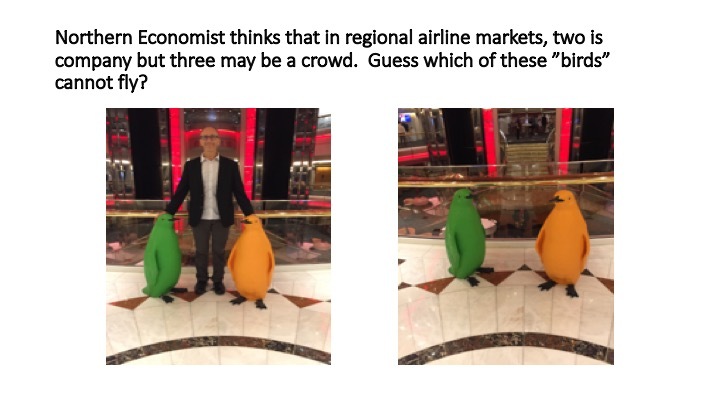 That means you can expect a price increase at some point in the future even though the newer planes and crews Rouge uses are likely lower cost per passenger mile. I guess I am now old enough to remember the preamble to the era of airline deregulation when Norman Bonsor, my Transportation Economics professor, would intone that deregulation was a plus for small regional markets like Thunder Bay because more expensive jet service would be replaced by more frequent and cheaper albeit slightly slower turbo-props – which is indeed what came to pass in Thunder Bay. Air Canada’s announcement is a bit like back to the future but the new jets today are much more fuel efficient and cost effective than they were in the 1970s and 1980s. Still, I am looking forward to seeing how this transition proceeds and the passenger response. Going from six flights a day to three will reduce passenger travel flexibility and one expects that Air Canada will schedule its three daily flights to Pearson similar to what Westjet is doing (which incidentally also in the last while went to three from four flights daily but still uses Q400s). For May, Westjet is showing departure times to Pearson from Thunder Bay of 6:10am, 11:50am and 17:50 pm and returns to Thunder Bay from Toronto departing at 9am, 15:10 and 21:50. One suspects that given Air Canada is more directly competing for passengers to Pearson with Westjet, it will have its flights in slots pretty close to Westjet. Air Canada’s move pretty much consolidates the alternatives from Thunder Bay into two – going to Pearson at nearly the same times at three times a day or going to the Island Airport. Of course, Porter is still maintaining its Q400 6-7 flights a day service to Toronto Island which means it may pick up even more business travel from Air Canada. It is unfortunate that Porter was not able to bring regional jet service to the Toronto Island airport because 5-6 flights a day from Thunder Bay on smaller yet faster regional jets such as a CRJ550 or CRJ700 (50 and 78 passenger max respectively) would definitely have smoked the competition out of Pearson. Still, I suspect that Porter will see a pickup in its bookings given its greater flexibility as well as its downtown location for business travellers. It will however probably need to reinvest in its aircraft stock as its fleet begins to age. 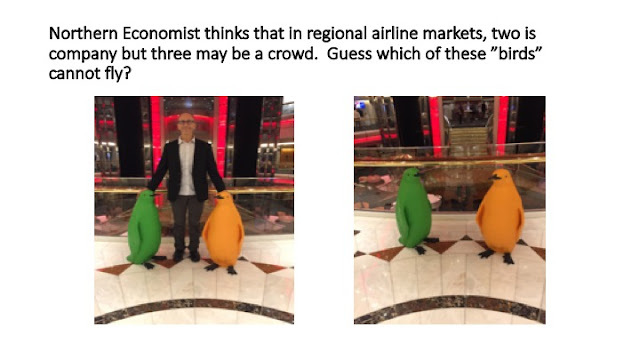 The other claim that was made was that the Rouge airplanes were roomier and more comfortable. Perhaps I am missing something here but having flown on some of the newer jets and flown Rouge overseas, I found the seating in the Q400 was actually a bit roomier compared to my last Rouge flight. But it will be roomier in business class (the 136 seat version of the A319 has a business class) and that may also be part of Air Canada’s strategy to hold onto business travellers who are much more lucrative to airlines than the rest of us. So, the changes have pros and cons and it will be interesting to see how everything comes out in the wash. The increased competition may eventually spark some real consolidation on the Thunder Bay route - after all, if Air Canada adopts Westjet time slots with larger and faster planes to Pearson, one might see an exit by Westjet and going down to only two airlines out of Thunder Bay. That really would be going back to the future. Or Westjet may respond by bringing in jets which will spark a pretty competitive period until the inevitable departure by one or more players brings back monopoly and higher prices. Interesting times are ahead. For those of you who have travel with Air Canada booked in May from Thunder Bay to Toronto, you can look forward to a message soon rescheduling your flight. Have a wonderful long weekend. The report argues that Canada’s advanced industries are not realizing their full potential and that these industries need to be targeted to build a dynamic advanced economy for future growth. About 11 percent of Canada’s employment – about 1.9 million jobs – is currently employed in these higher wage advanced industries and they generate 17 percent of GDP, 61 percent of exports and 78 percent of research and development. Services account for about half of the Canadian advanced industry worker base followed by manufacturing at about 36 percent. What is more interesting is the variation in scale, intensity and diversity of this sector across provinces and Canadian CMAs. Ontario, Quebec, Alberta and British Columbia together account for 91 percent of advanced industry employment which is just a bit more than their total employment share which is about 87 percent. Not surprisingly, the CMAs with the most advanced industry jobs are Toronto, Montreal, Calgary and Vancouver. However, productivity growth in this sector has been lagging relative to the United states. What is particularly disconcerting from the point of view of northern Ontario economic development however is the fact that every Canadian CMA added advanced industry employment between 1996 and 2015 – the exceptions being St. Catharine’s-Niagara, Greater Sudbury and Thunder Bay. 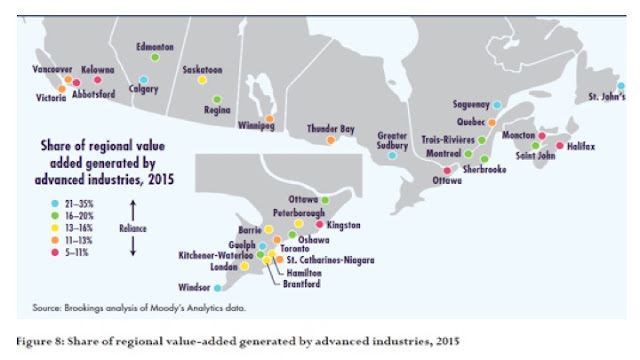 Thunder Bay also ranks low when it comes to the regional value added generated by advanced industries (See figure taken from page 22 of report) whereas Sudbury does better because of the intensity of its mining sector. Moreover, Greater Sudbury and Thunder Bay are also at the bottom of the CMA rankings when the number of advanced industry specializations is compared in terms of local concentrations of activity. Boosting advanced manufacturing in Canada according to this report requires a strategy of “four C’s” – capital, competition, connectivity and complexity. Capital is of course the most fundamental – that is, investment in machinery and equipment but also knowledge capital such as information and technology systems. The weakness in business investment has been a long-known factor in Canada. As for competitiveness, Canadian industries have traditionally had less exposure to intense competition and this may be limiting the capacity of its advanced industries to innovate. Fixing this requires greater market competition and indeed deregulation and easing foreign ownership restrictions. Connectivity involves Canadian firms participating more in global value and production chains and networks. Finally, complexity requires firms to master the technological complexity and specialization of the modern economy and this is often measured by patent activity which in Canadian CMAs is generally below American ones. Policies for building connectivity and complexity in the end also involve the unleashing of greater competitive forces within the Canadian economy in order to achieve the market size or scale within which advanced industrial output can grow. Thus, a major obstacle for Canada when it comes to growing its advanced industrial sector is its highly regional nature which in the end results in barriers to internal trade, less competition and small market sizes that militate against the scale needed to grow output. In the case of northern Ontario, even with the growth in local entrepreneurship which has been quite noticeable in its larger cities such as Thunder Bay and Sudbury, it remains that without growth in market size, new innovative ideas will be like so much seed fallen in rock if the companies cannot grow their output. In the end, any regional economic policy must focus on increasing the scale of output by boosting market size either via exports or via immigration and local population growth. informing me that the Globe and Mail would no longer deliver a paper copy in Thunder Bay starting September 1st. The letter stated rising costs and service delivery issues as the reason and offered as a substitute a cheaper subscription to the electronic Globe and Mail known as Globe2Go. Oddly enough, our service has actually improved immensely over the last while and given all the airline competition and additional flights out of Thunder Bay (The Toronto edition of the Globe & Mail is flown into Thunder Bay every morning and delivered throughout the day) I do not see how costs have risen that much. Yet, who am I to quibble with one of our many overlords from Toronto who constantly develop new methods to affect our daily lives here in the North. In some respects, I suppose this was probably inevitable. I used to have a subscription to the National Post and they too left the local market citing costs. They also dangled the prospect of a digital subscription at the time they left. This departure is particularly annoying because it also means I will no longer get my Sunday New York Times delivered. It came on the Monday but its heft was something I looked forward to. Now, its not that I do not use computers or the internet (I'm blogging am I not?). However, I find reading a newspaper on the computer or an ipad or an ipod inevitably feels like …being at work. For some reason, I find reading the physical newspaper a more reflective ritual whereas once I’m on an electronic device I simply point and click on a few items, scan quickly and move on. I get greater personal value from the more expensive hard copy than I do from the cheaper digital version. If I’m only going to point and click on half a dozen stories, well the main ones are available for free on the web either from the Globe or dozens of other competitors. Moreover, once you are into electronic subscriptions, the market opens up dramatically. Whereas I only have the choice of the Globe and Mail or my own local paper when it comes to hard copy newspapers, once I start to consider electronic subscriptions – well, the choice is limitless. In some ways, this is an opportunity to reappraise how I currently get my news. I suppose the Globe and Mail is gambling I am so addicted to their product that an electronic Globe is better than no Globe at all. I’m not so sure. Maybe it is time to subscribe to the New York Times electronically or perhaps the Guardian to get my international news and rely on my local newspaper subscription and free web access to Canadian dailies for my Canadian news. Maybe it is time to consider the choice between what the Globe offers electronically compared to the National Post. In any event, I’m going to take some time to decide what I’m going to do given that I now am being forced to choose. By the way, when the National Post decided to stop delivering in Thunder Bay, I did not take out the digital subscription.